Imaging Science cited as one of the key reasons why RIT is among the top schools in the world for producing innovators and entrepreneurs. Innovation and creativity aren't exclusive to the most prestigious centers of education. They exist in schools all around the world with cutting-edge programs in science and tech, even if they fly further under the radar than "that college in Boston." To build our list, we considered a variety of criteria, including ranking, research facilities, important technological discoveries, notable faculty and alumni, cost and relationships with the private sector. We drew our stats primarily from U.S. News & World Report and Times Higher Education rankings, as well as slightly lesser-known lists like this one from Great Value Colleges. Scroll through the most promising of these schools below. Is yours one of them? 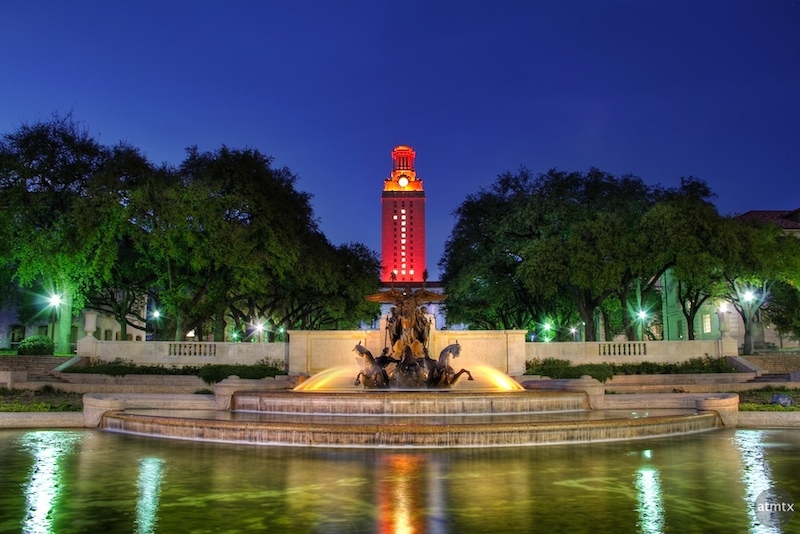 The University of Texas at Austin has a lot of things going for it: its proximity to Austin, itself the home of a bustling startup scene; its connection to South by Southwest, a big-name technology and ideas conference; one of the country's top engineering programs; and a number of notable alumni, including Neil deGrasse Tyson and Dell founder and CEO Michael Dell (though Dell never finished, dropping out in 1984 to sell computers). University of Toronto's beekeeping program. The University of Toronto is home to Geoffrey Hinton, a distinguished emeritus professor of computer science who, as the Toronto Star put it, is the "godfather of a type of artificial intelligence currently shattering every ceiling in machine learning." He also works part-time at Google, which recently spent $400 million on the purchase of an artificial intelligence company, as a "distinguished researcher." U.S. News and World Report ranked RIT eighth on its 2015 list of Best Regional Universities (North), and it also offers a plethora of interesting programs, including video game design and imaging science majors. RIT is also well-known for its career-oriented approach to learning: Its large co-op program partners with over 1,900 employers worldwide to give students real-world work experience before they're actually out there in it. "A member of the Swiss Federal Institute of Technology Zurich robotics team shows the field that the team's entry in the Nano Cup robotics competition ... at Georgia Tech in Atlanta." With one of the best engineering programs in the country, including top 10 spots in every engineering category according to U.S. News & World Report, Georgia Tech is renowned as a top destination for tech whizzes. But it's also home to the Georgia Institute of Technology Cooperative Division and the Graduate Cooperative Education Program, two large influential programs that place students in real-world working environments. Located in Delft, Netherlands, the city's namesake university is the biggest and oldest university of technology in the country. It's also the incubator for a number of rad projects, like Denise, a robot with the ability to walk like a human, and Nuna, a solar-powered race car that won the World Solar Challenge four times in a row in the 2000s. Prince Harry has a grand time at Imperial College London's Center for Blast Injury Studies. U.S. World News & Report placed Imperial College London twelfth on its list of top global universities, and the Times Higher Education World University Rankings ranked it sixth in the world for engineering and technology, alongside titans like Stanford University, Massachusetts Institute of Technology and Princeton University. Meanwhile, according to the New York Times, recruiters from high-ranking companies in 20 countries put it ninth on its graduate employability list. Even Prince Harry is a fan: He helped open its Center for Blast Injury Studies, a cutting edge program that studiescombat-related injuries. "Worcester Polytechnic Institute students from left, Brian Morin, Paul Greene and Geoffrey Elliott pose with a laptop computer, which is logged onto the Microsoft homepage showing the company's Internet browser Tuesday afternoon, March 4, 1997, in Watertown, Mass. Greene uncovered a major security flaw in Microsoft's browser and along with Morin and Elliott posted the discovery on a public Internet bulletin board after being ignored for several days upon reporting the bug to Microsoft. The flaw could allow a Web site operator to secretly run programs or destroy files on someone else's personal computer." Counting among its alumni Robert H. Goddard, the creator of the first rocket powered by liquid fuel, Paul Allaire, the former CEO and chairman of Xerox, and Gilbert Vernam, an early pioneer of cryptography, WPI in Massachusetts is also known for its propensity to churn out cash-friendly graduates — Bloomberg Businessweeknamed it one of its top 20 schools for return on investment in 2012. Google CEO Larry Page, Cornell University President David Skorton, Technion professor Craig Gotsman and former New York City mayor Michael Bloomberg hold a press conference to answer questions about Cornell and Technion's tech campus, which temporarily resided in Google's New York City headquarters. Israel is home to one of the best and brightest startup scenes on the planet, and its top university is just as formidable. Bloomberg Businessweek included it — the only non-U.S. entry — on a list of "Top 10 Colleges for Tech CEOs," and in 2012, it partnered with Cornell University to build a new engineering and applied science school on New York City's Roosevelt Island. In 2012, the school's Advanced Technology Park got a makeover, including a new name — the Montana State University Innovation Campus — and a new director, Teresa McKnight, who envisions it as a go-between for research and the private sector. In 2015, it has a variety of fields to its name — optics, biotechnology, agriculture, information technology — as well as number of projects, like the Center for Bio-inspired Nanomaterials and the Thermal Biology Institute. Siemens Senior Vice President Terry Heath examines an offering at an entrepreneurship conference held at UC Berkeley. Former Australian Prime Minister Kevin Rudd examines a prototype for a bionic eye at the the University of Melbourne. In the 1960s, Graeme Clark, a researcher at the school's Center for Neural Engineering, began to study the field of cochlear implants. In the 1970s, he and his colleagues developed the world's first bionic ear — a device that would later be implanted in more than 300,000 patients with hearing problems. Clark isn't done yet, however, despite being your grandfather's age: In an interview with the Sydney Morning Herald in July, he described excitement over his new projects, which "could help with treatment of paraplegics, epileptics and ... the bionic eye implant." "Mellon Mays Undergraduate Fellow Cesar Orellana '17 describes electro-spinning during summer research open house." It may be the most expensive college in America, but the California institution also recently came out on top in the undergraduate engineering game: U.S. News & World Report awarded it first place on its 2015 list. It's also making strides to improve diversity within STEM fields, despite a few missteps along the way. "The #604 NUS Urban Concept, Hydrogen UrbanConcept, from NUS, turns a lap on day four of the Shell Eco-marathon Challenge Asia at Sepang International Circuit in Kuala Lumpur."